Copper T - A Better Contraceptive? 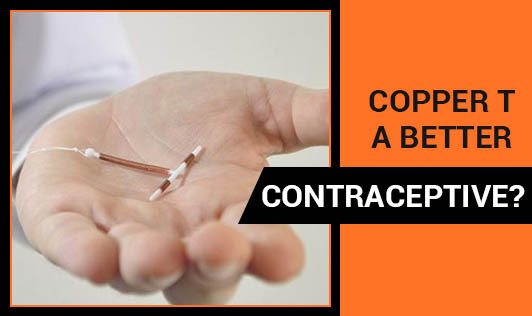 Copper T is an intrauterine device (IUD) placed in the uterus for avoiding pregnancy. It is said to be most protective method to avoid sperm joining the egg. The exact mechanism is unknown to public except doctors. It enhances protection for 10 years. It is named as copper T as the device is in ‘T' shape. Most copper T devices are plastic T-shaped frame that is wound around with pure electrolytic copper wire and/or has copper collars (sleeves). The arms of the frame hold the intrauterine device (IUD) in place near the top of the uterus. The T shaped treats sperm as a foreign body and doesn't allow it to implant with the egg. The effectiveness of avoiding pregnancy is high in copper T. It is more effective than condoms, oral contraceptives and other barrier methods. The shelf life of copper T is said to be 7 years. Once copper T is removed the normal pregnancy can occur. Copper T is recommended for women who have already had one child, choose not to use hormonal contraceptives and not have the history of pelvic inflammatory disorder. 1.It doesn't give protection from sexually transmitted diseases (STD). 2.Infection rate is high. Allergy is caused due to copper covering; appearance of rashes may be a common problem. 3.Menstrual cramps are severe and bleeding is heavier than usual for the first 3 months of insertion. 4.Insertion of copper T may induce iron deficiency. Iron supplements may be recommended till the copper T is present in uterus. 5.Chances of pregnancy are less, but option of getting pregnant can't be ruled out. Yearly check up for the device is necessary. 6.Cuts in the uterus are also a possibility. Consult the doctor immediately. 7.Even If the device is inserted and women get pregnant, the complications are high. Miscarriage is obvious. 8.Women with Wilson's disease (excess of copper in the body) should not try for insertion of Copper T.
Though copper T is said to be better than all other contraceptive methods, that's better it is consult a gynecologist, have a thorough check up and then take a wise decision.